The temperature at the surface of Venus is very high (737 K=474 °C) and hardly varies from the sunlit side to the night side. At the end of the 1950s, the observation of centimetre radio emissions, identified as being due to thermal radiation of the ground, thus indicating an extremely high surface temperature, were confirmed by radio measurements by the American probe Mariner-2 in 1962, and then by the first soviet Venera missions. The temperature of the ground is close to 460.0C. 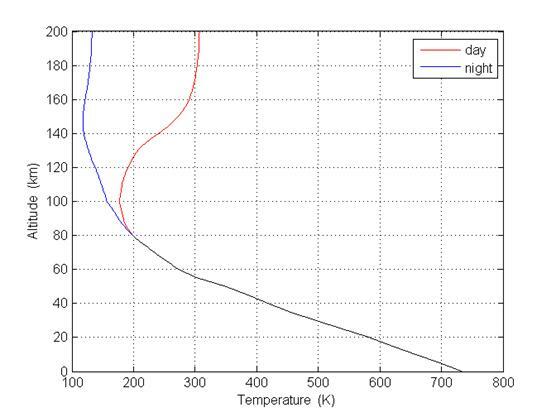 The temperature profile between 0 and 100 kilometres is noticeably different from that of the Earth. 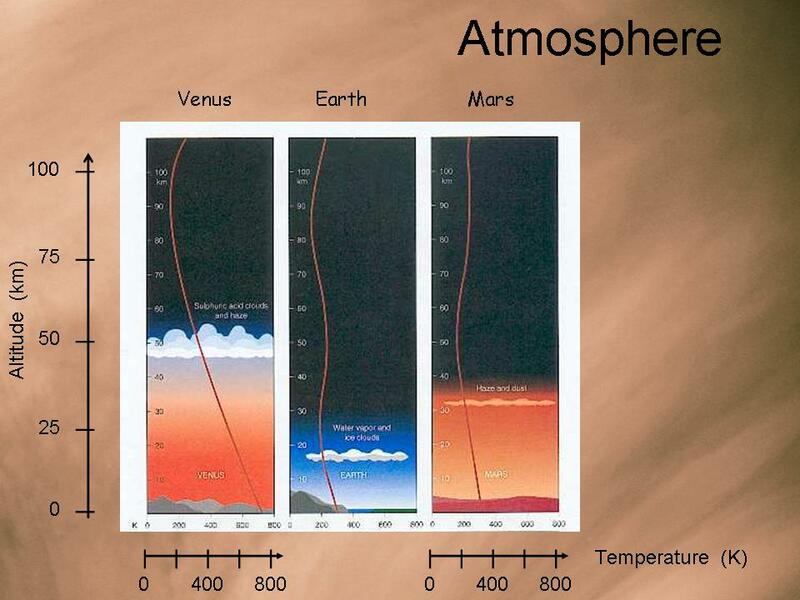 In the case of the Earth, one sees a temperature inversion at about 12 kilometres altitude, where the temperature starts to rise with altitude, attaining a maximum at 45 kilometres (the zone of positive thermal gradient defines the stratosphere). This temperature is not only due to the Sun’s proximity. 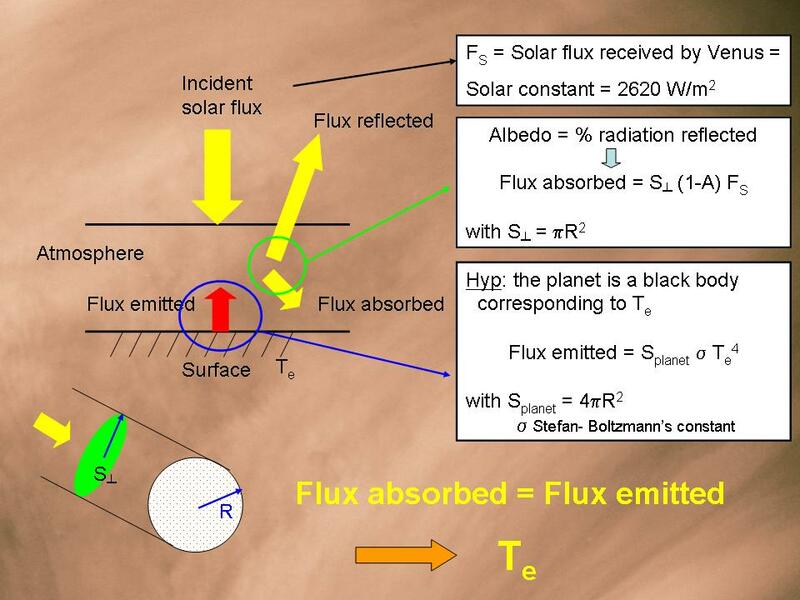 We also have to consider the clouds that reflect a large part of the incident light back into space, such that the net energy flux at the surface of Venus is less than that received on the Earth. The total quantity of energy per unit time and area at the top of the atmosphere, integrated over the whole spectrum, corrected for the average distance separating the planet from the Sun, is called the solar constant. This solar flux (Fs) that Venus receives reaches 2620 W/m2. Part of this insolation will be reflected by the surface and the atmosphere: the percentage of the radiation reflected by a planet is called its albedo (A). The quantity absorbed is then given by (1-A). However, a planet also emits energy, in the form of thermal radiation. An equilibrium forms between the amount of energy arriving from the outside, that produced by the planet, and that absorbed by its atmosphere. 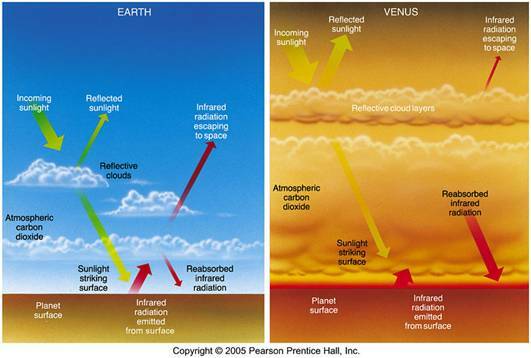 Read more about "Temperature and greenhouse effect"